Biosceptre International Ltd. ("Biosceptre" or "the Company") is an immune-oncology company that has identified a novel receptor cancer target—a variant of P2X7 (nfP2X7)—that exists in a range of cancers, including lung, breast, colorectal, and prostate, but is not found on healthy tissue. Because of this specificity, drugs directed to the nfP2X7 target may prove effective at treating cancers with high precision and minimal side effects. 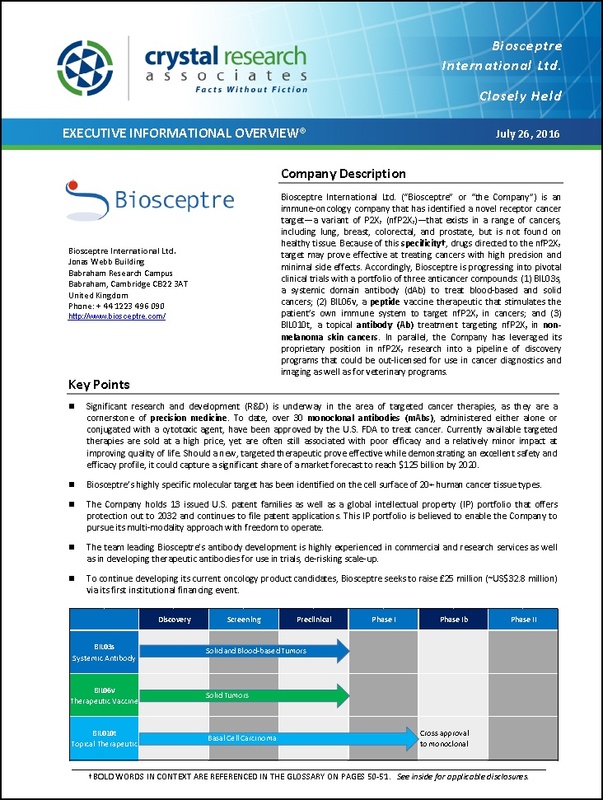 Accordingly, Biosceptre is progressing into pivotal clinical trials with a portfolio of three anticancer compounds: (1) BIL03s, a systemic domain antibody (dAb) to treat blood-based and solid cancers; (2) BIL06v, a peptide vaccine therapeutic that stimulates the patient's own immune system to target nfP2X7 in cancers; and (3) BIL010t, a topical antibody (Ab) treatment targeting nfP2X7 in non-melanoma skin cancers. In parallel, the Company has leveraged its proprietary position in nfP2X7 research into a pipeline of discovery programs that could be out-licensed for use in cancer diagnostics and imaging as well as for veterinary programs. * The Corporate Snapshot was last updated on July 26, 2016.